This walk: 2014-2-19. P (Peter Tavy) boundary stone, Wedlake, Roos Tor Bottom, reave, hut circles, slit trenches, mortar pits, gun emplacement, Roos Tor, Duke of Bedford stones 1890, 1847 markers, tinners pits, Quarryman's Path. P stone at SX 52981 76929, bearing a "P" at SX 5297 7693, on the corner of enclosed land, taken to be a Peter Tavy parish boundary stone. An online photo. A sunny weather photograph of the stone can be seen on an earlier walk: 23 May 2012 (nearly halfway down the page). Zoomed view to Higher Godsworthy. Old wheel ruts indicating that this water feature is an old track. A panorama filmed at SX 5390 7714, close to the settlement of many hut circles. The photographs following are of features described by J. Butler (1991), Dartmoor Atlas of Antiquities II, The North. 31.7 Roos tor north west, pages 86-87, this being a settlement of 73 hut circles - one of the largest settlements on Dartmoor. Somewhere up there is a reave, running up to Roos Tor. 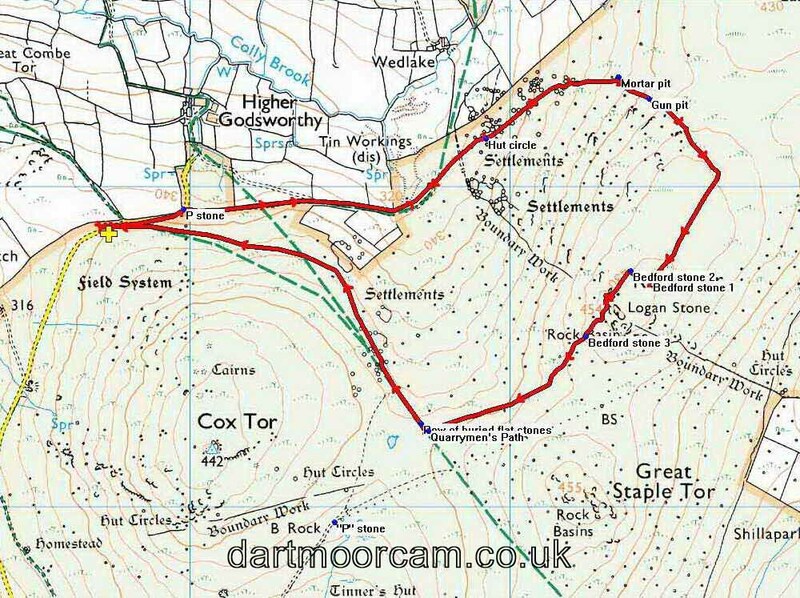 In this area runs the Great Western Reave, runs 10 km (6 miles) from White Tor, over nearby Roos Tor, to Sharpitor. Also: Heritage Gateway reference. A large hut circle with others behind and right. Very large hut circle with sub-dividing walls, near the centre of the settlement. This is probably the one recorded by GPS as being at SX 53927 77149 (I didn't make a note as to which circle this was but ......). Another circle - there are 73 to choose from (apparently). A larger gun pit at SX 54436 77275, from WW2. The 1847 and 1890 markers together. The lichen appears to have Cladonia-like fruiting structures, but nothing like pixies matches. Another view of the tinners' pits. A paved section of the Quarryman's Path, built to anable workers from Peter Tavy to walk to work at Merrivale Quarry. This walk was accessed from Tavistock by following the road to Two Bridges and turning left at the white road sign post directing to Higher Godsworthy, This is 1.1 km (� mile) from the A386 road from Tavistock to Okehampton. There is roadside (on the moor) parking marked by the yellow cross. Distance - 5.25 km / 3.26 miles.